New York City in the Jazz Age was host to a pulsating artistic and social revolution. Uptown, an unprecedented explosion in black music, literature, dance, and art sparked the Harlem Renaissance. While the history of this African-American awakening has been widely explored, one chapter remains untold: the story of a group of women collectively dubbed "Miss Anne." Sexualized and sensationalized in the mainstream press—portrayed as monstrous or insane—Miss Anne was sometimes derided within her chosen community of Harlem as well. While it was socially acceptable for white men to head uptown for "exotic" dancers and "hot" jazz, white women who were enthralled by life on West 125th Street took chances. Miss Anne in Harlem introduces these women—many from New York's wealthiest social echelons—who became patrons of, and romantic participants in, the Harlem Renaissance. They include Barnard College founder Annie Nathan Meyer, Texas heiress Josephine Cogdell Schuyler, British activist Nancy Cunard, philanthropist Charlotte Osgood Mason, educator Lillian E. Wood, and novelist Fannie Hurst—all women of accomplishment and renown in their day. Yet their contributions as hostesses, editors, activists, patrons, writers, friends, and lovers often went unacknowledged and have been lost to history until now. In a vibrant blend of social history and biography, award-winning writer Carla Kaplan offers a joint portrait of six iconoclastic women who risked ostracism to follow their inclinations—and raised hot-button issues of race, gender, class, and sexuality in the bargain. 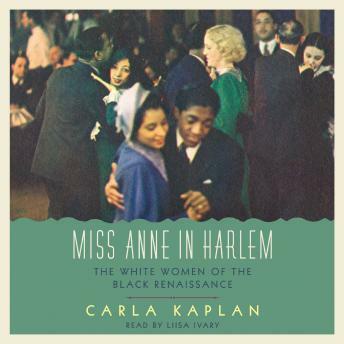 Returning Miss Anne to her rightful place in the interracial history of the Harlem Renaissance, Kaplan's formidable work remaps the landscape of the 1920s, alters our perception of this historical moment, and brings Miss Anne to vivid life.